I thought it would be fun. You know? I had to go away — to Germany, for a conference, not that it matters — and I wasn’t going to be able to keep up with an episode post every day. 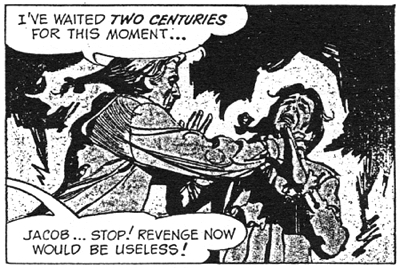 So I thought, I’ll spend two weeks writing about the 1971 Dark Shadows comic strip. That’ll be fun and easy, I can write them on the plane (which I didn’t, really) and I won’t have much to catch up on when I get home (which I really did). The thing that I didn’t realize was: this comic strip is a wake. It started just before the show ended, and then kept going for a year, a drawn-out death rattle. This fun little two-week sidebar has turned into my first real encounter with the end of the show, a vision of April Third and what lies beyond: a Christmas Yet to Come. I’ve written about other post-mortem spin-off material — the 1991 revival, the Big Finish audios — but this one feels different, because the comic strip was there, at the scene of the crime. 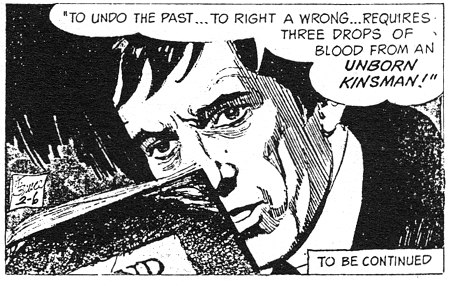 And right now on the blog, I’m in the 850s, right at the peak of Dark Shadows’ popularity, and just before things start to go wrong. The comic strip is a vision of the near-future, and not a promising one. 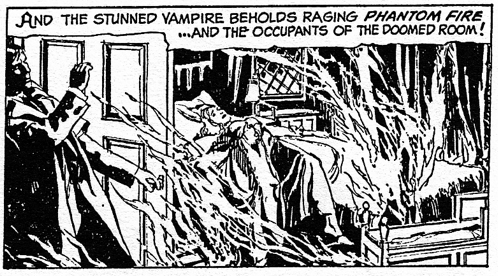 But what is Dark Shadows, if not a contemplation of death? Yes, the show will be cancelled. The nighttime revival will fail, and the teen-drama reboot, and the several disappointing movies. Dark Shadows will never come back. I will die, and everything that I love will die. But at least I’m going to outlive this goddamn comic strip. 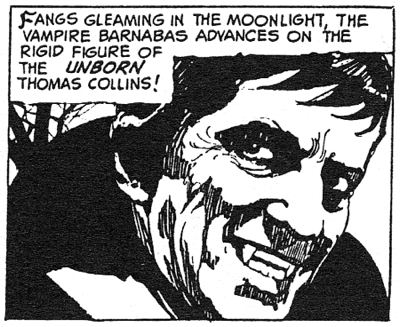 The unborn Thomas Collins — who does not exist — has reached out to comic strip Barnabas, asking him to unwrite a specific bit of Collins family history which didn’t actually happen. Back in 1772, when Joshua and Naomi and Jeremiah and Abigail were all living at the Old House with a two-year-old Barnababy, there was also this make-believe phantom Collinwood, inhabited by two brothers named Jacob and Esau. Jacob’s wife, Agnes, was dying of the plague — don’t ask me what plague, I have no idea. “She had contracted the dreaded plague,” it says. I’m not an expert in imaginary colonial epidemiology. Agnes had just given birth to a son, William, and she dropped a lantern, which set fire to the room. Jacob was about to rescue his wife and son from the blaze, when his brother Esau — seeing an opportunity to gain control of the Collins fortune — smacked Jacob in the back of the head with something solid and heavy, and then dumped his body off the cliff at Widow’s Hill. Then I guess he went back to the house, and put the fire out. 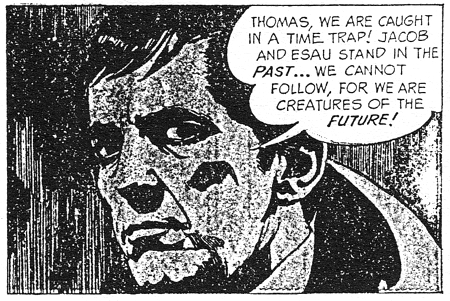 And now, Thomas Collins — the would-be descendant of dead baby William — is telling Barnabas some hard truths about the nature of time and death and fire and the universe. The Fates are kind, he says. Every hundred years, they offer mortals an opportunity to change history, he says. There’s a three-day grace period to rewrite the past, he says. Thomas: Barnabas, you… a vampire… can somehow find the key to unlock the door of time. I beg you, help me! So — yeah. Didn’t Thomas just say that there’s a way? The Fates offer mortals an opportunity to change history. All of a sudden, it needs a vampire, and it’s up to him to figure out how to roll back time. Barnabas: Wait! In the basement of my cottage are some ancient volumes, filled with the spells and incantations of antiquity! But remember, Thomas… I promise nothing! Even if I can roll back the centuries, no one can predict what will happen when Jacob Collins confronts his murderer! I don’t know why everybody is flip-flopping like this. They just are. The comic strip only has three panels a day; that’s why they simplified the show’s complex soap-opera structure down to a basic, repeatable formula. It’s just Barnabas, diagnosing and treating the problems of the past, protecting Elizabeth and Carolyn from the hauntedness of their house. Up until now, the stories have been illogical and silly, but they run in a recognizable pattern that the readers can follow, from day to day. But now — in the last couple months of the strip’s first year, when they’re presumably trying to get renewed for another twelve months — they’ve created an impenetrable puzzle that you can’t even follow in the reprint book. There are multiple contradictory flashbacks, telling different versions of the backstory — what’s written in the family history, versus what really happened — narrated by a flesh-and-blood phantom who keeps announcing that he doesn’t exist. And then in the course of a week, they present three completely different explanations for how to change history. Every hundred years after an “important event”, whatever that means, the kind Fates give mortals the chance to go back in time and change things. Barnabas, as a vampire, can find the key to unlock the door of time. Barnabas finds an ancient book in the basement that says you need three drops of blood from an unborn kinsman in order to undo the past. The rules keep shifting from day to day, sometimes from panel to panel. Each one of these postulates is complete nonsense on its own, and combined, they’re incomprehensible. It’s an amazing display of close order self-sabotage. Yesterday, I was worried that the comic strip was going to destroy the show’s legacy, and needed to be unwritten. And here it is, unwriting itself, just in the nick of time. Barnabas: Thomas, you will play an important role in determining your fate! Thomas: There is no pain for me, Barnabas… my body is devoid of feeling. It is merely a temporary flesh-and-blood shelter for a soul in misery. Barnabas: Okay, whatever. Come here, you look tasty. The vampire lets three drops of blood from the unborn Thomas Collins drip onto the unmarked grave of the infant William, there’s a peal of thunder and a hi-ho Silver, and the spectres of Esau and Jacob appear in the graveyard. Then it gets a little bit weird. 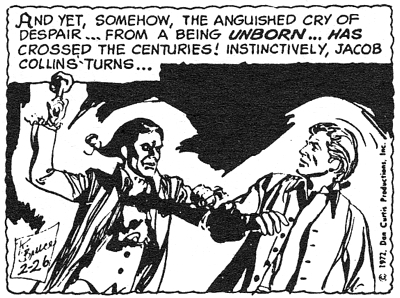 “I’ve waited two centuries for this moment!” the spirit of Jacob cries, reaching out to throttle the spirit of Esau, because that’s how ghosts kill each other. But then Barnabas steps in, with another late-breaking update from the rulebook. Barnabas: It won’t be that simple, Thomas! All events of the past must remain as they were! Jacob Collins will not know his brother plans a sneak attack! Thomas: Can’t we warn Jacob… or help him? Barnabas: No. Even though we will be together physically, all of us are centuries — and worlds — apart! So — what? Then what’s the point of doing this at all? Isn’t Thomas the one who knows how this works? What are you talking about? And it just rolls on and on, each line contradicting the last. Barnabas is the only one who can change history, except he can’t, he’s just an observer. Jacob will remember what’s happened, except he won’t. Thomas can’t reach across the chasm of time and existence to warn Jacob of Esau’s attack, except that is exactly what he does. All we can do is watch. That’s the main character of the show, and the strip, putting the audience in their place. The past is already over, we are worlds apart, and all we can do is watch history play out, exactly as it happened, as it is happening, as it will always happen, no matter how many times you rewind. Julia’s injections will bring Barnabas back to life, to rejoin Quentin and Angelique at Collinwood, and defeat Count Petofi. The Leviathans will rise, and the ratings will fall. Everyone will go to Tarrytown to make the movie, which is difficult and exhausting, and the show will dwindle and fade. All we can do is watch, like the unborn Thomas, a ghost from a possible future that never happened. We can’t change the past; it has to change itself, and it never will. Thomas: Jacob — look out behind you! Barnabas: It’s no use, Thomas! You cannot call out across the barrier of 200 years… Jacob doesn’t hear you! Because the audience always has a role in long-running serialized narrative, even long after it’s made. The show was cancelled, but it wasn’t killed. It lives on, sustained by the audience that was, and is, and the audience yet unborn. Our anguished cry of despair crosses the centuries. History can’t be rewritten, but as long as we’re watching, it can’t be unwritten. Barnabas: Still a few loose ends remain to be cleared up! The infant son of Jacob Collins — your ancestor — did not perish in the flames! The unmarked grave does not exist… and never did! Barnabas: Did they, Thomas? For that matter, did you see it? How could you… since you have not been born yet! Thomas: But what about Esau’s kids? Thomas: Well, Esau killed all those people so that he would inherit the family fortune. Then Esau must have had children and grand-children, and so on, leading to Elizabeth and Carolyn in 1972. Barnabas: Yeah, I guess so. Thomas: But now that we’ve changed history, Jacob and his infant son survived, so Esau’s kids didn’t inherit Collinwood. Thomas: And we know that William’s descendants survived, because duh, here I am, the about-to-be born. So I should be the one who owns Collinwood, and Elizabeth and Carolyn are the cousins from England. Right? Barnabas: Um. I don’t know. And that’s where the comic strip ends, in tangled confusion, unwriting itself before anyone else gets a chance. The torch is passed to the next keeper of the flame — the Gold Key comics — and new generations of the Collins family are born, and unborn, and reborn. It’s a happy ending, I guess, if you don’t think about it too hard. And why would you? The comic seems par for the course in terms of the series, as they pace quickly day-to-day. Reading your summary, I’m reminded of the “only way(s) Jeb can die” story points from the upcoming Leviathan arc, the repetitious 1840 with its butterfly-smashing ending, and, of course, every reboot of the show. Lightning never strikes twice. Not even in a bottle. It’s not a bad story idea, just poorly executed. The hidden room is not so different from Parallel Time. Should also have ended with Thomas showing up at C’wood’s front door announcing himself as a cousin from England. BTW, if Barnabas and Jeremiah were the same age, literally, they were both born in 1763 (shown on Jeremiah’s gravestone). Where does 1770 come from?